Nini DeLuca, the members of the Elmsford Volunteer Fire department and other Elmsford leaders highlight that there are people in the community who use their energy to do good for others. And, they don’t limit their volunteerism to their own neighborhoods. Their work will make many people smile. For 13 years Bishop Judge served at Our Lady of Mount Carmel in Elmsford. He was highly regarded and his work as parish administrator was appreciated by congregants. He then returned to Nigeria (in 2010) to serve as Bishop. Members of Our Lady of Mount Carmel have visited Nigeria a few times since the Bishop left Elmsford and have worked hard to help the residents of Ondo, the community that Bishop Judge is the spiritual leader of. They have interacted with people who are poor but happy and grateful. The Elmsford Fire department, congregants and community have worked with the Bishop and the people of Ondo donating medical supplies, 3000 books from Elmsford schools and Maria Regina High School. They met with Ondo Governor Olusegun Mimiko and His Royal Highness Oba Yusuf Adebori Adeleye, king of Oba-Akoko. Mrs. DeLuca’s husband, Pete DeLuca, visited Nigeria for a third time, with his mission to educate medical personnel on how to use the ambulance donated by Elmsford to the medical center. When Elmsford received a new ambulance, DeLuca—a deputy fire chief in Elmsford—asked Elmsford officials if the old ambulance could be donated and shipped to Nigeria, which it was. 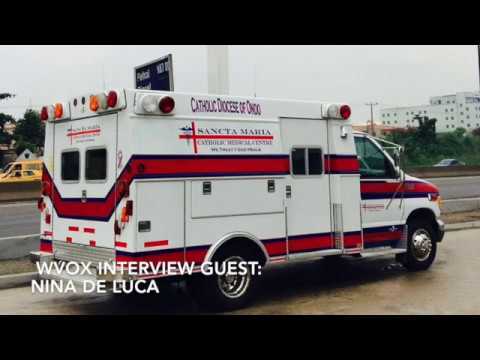 Last month I interviewed Nini Deluca and Bishop Jude on my WVOX radio program. The link to the interview is below. I thought that you would find this interview with one of your Greenburgh neighbors inspiring.